Whether you are getting ready to have a baby, you are caring for a baby, or your child has outgrown his or her infant car seat, it is very important that you always have an appropriate seat available for trips that require a vehicle. Failing to do so could have horrific consequences, including death if you are involved in an accident with a child that is not restrained properly. Infants under one year of age that are in the appropriate rear facing car seats have a 71% decrease in their risk of death. Toddlers who are in the appropriate car seat for their height and weight have a 54% decrease in their risk of death. Children between the ages of 4 to 8 that are in the correct booster seat reduce their risk of injury by 45%. Children over 8 years and through adulthood who use seatbelts have a 50% reduction in their risk for death and injury. The amount of risk involved with not using a car seat, or properly restraining your child based on his or her age, weight, and height shows just how important it is to use a car seat. In 2012 alone, 31% of all children under 8 years old who died as a result of a car crash were not in a car seat, or were completely unrestrained. In most cases, these deaths could have been prevented. You also need to be aware that car seats are required by law in every state. Not only will you risk your child’s safety, you will also be required to pay fines if you are found not using one. There is no denying that infants are considerably safer when transported in an appropriate car seat. However, there are other reasons for using an infant car seat. Your new baby has been snuggled up inside mommy for nine months, which means he or she is used to being snuggled. When you use an infant car seat, you are also making your new baby more comfortable, and helping him or her to feel safer when not in your arms. Infant car seats are also specially designed for newborns weighing under 20 pounds. This ensures that the seat is designed around an infant’s unique safety needs, including helping to protect the head and neck. Toddlers are at that fun stage when they really begin growing, being more vocal, and gaining considerably more motor control. However, this does not mean that your child is automatically ready for a front facing car seat. While many parents consider rear facing car seats as only being for infants, this just isn’t true. While many states have laws saying that children over 20 pounds are fine in a front facing car seat, the American Academy of Pediatrics actually recommends that you keep babies and toddlers up to 2 years of age in a rear facing car seat. This is because it provides better safety and protection if you are ever in an accident. Rear facing car seats help to spread the impact of a car crash across your baby’s body and chest, rather than allowing the head and neck to take the majority of the impact. Young children have very little control over their neck muscles, and that sudden back and forth that happens during a crash can cause serious damage, and even death. As your child grows, he or she will eventually outgrow the front facing car seat as well. You need to make sure that you actually keep your child in a car seat until their height and weight show that it is time to move to a booster. Each time you switch to a new type of car seat, you are actually lessening the protection that each one provides. A booster seat protects children who aren’t quite tall enough for an adult seat belt to fit across them properly. Some include a five point harness like those used in car seats, and others use guides to ensure proper placement of the seatbelt. Of the two, the harness option is best. Parents of older children need to make sure they are wearing the seatbelt properly when in the booster, rather than allowing them to put it behind them. When the seatbelt is not across the child where it should be, an accident can cause serious damage to their neck and spinal cord. The booster also ensures that the lap belt goes across your child’s hips, rather than their abdomen. When a seatbelt is worn across the stomach, a severe crash can result in serious internal injuries. As your child gets older, it is likely that he or she will try to convince you that the booster is no longer needed. Again, if you want to make sure your children are protected, make sure they use the booster until they are at least four feet, nine inches tall – this is the minimum height at which most car seatbelts will fit properly. Protecting your child is much more important than hearing them complain that they are big enough not to need one. Another important part of using a car seat is making sure that it is installed properly. You should always make sure you follow all instructions when installing your car seats. It is also a good idea to visit your local fire or police department, or even your local hospital in some areas – these places will look at your car seat to make sure it is installed properly, and make sure you are buckling baby in correctly, and it is free of charge. Car seats are vitally important for your baby and older children. Failing to use one not only means you are breaking the law, you are also putting your children in serious danger, including a seriously increased chance of death. Whether you are looking for a car seat for your new infant, or to replace an older model, it is important that you know what to expect and look for to make sure you make the right purchase. There are hundreds of car seats available, and each is designed for specific ages and uses. Additionally, each car seat is built differently, which can have a serious impact on how it works for you. Keep reading to find out what you need to look for in a car seat. It is always best to purchase a new car seat, rather than borrowing or using a second hand option. Car seats are often recalled due to safety issues, and if a car seat has been in an accident already, it will not provide the same protection as it did before the impact. You should also make sure that the one you choose includes a manual so you can make sure you know exactly how to use it in your vehicle – not all car seats are the same! Buying a car seat requires research. You will have to find out exactly what the laws are in your state so that you can plan your purchase accordingly. Some states have strict laws about weights and ages that have to be in rear facing, forward facing, and booster seats. You should always make sure you follow the applicable laws to ensure your baby is as safe as possible in the event of an accident. You will also want to take the time to read some of the reviews on individual car seats before you buy. This will allow you to decide whether the one you are interested in will be the best fit for you. Some car seats don’t work well in small or compact cars, while others may be difficult to install, use, and adjust. By taking the time to read reviews you will be able to avoid those that other parents have had problems using. There is a variety of car seats available, and they are often referred to in stages. These stages are generally broken down by the baby’s age, weight, and height. However, you should keep in mind that you should try to stick with the stage that is appropriate to your baby’s weight for the safest car rides. Newborns: When purchasing a car seat for a new baby, you can choose either an infant seat or a convertible one. The infant seat is designed to work only as a rear facing car seat, while the convertible option works as a rear facing option and front facing option, which you will use when your baby is older. The most significant difference between these two options is that you can remove the top portion of the infant seat to use to carry baby – this can be a major bonus when baby is sleeping. Forward Facing: These car seats are designed for children who are over the weight limit for rear facing seats. It is recommended that children who are under the age of two always use a rear facing seat as they provide more safety. There are also booster seats with harnesses, and those that have guides that position the seat belt properly for children who are under 57 inches. Booster seats are for older children, and are designed to make it safer for them to use the same seat belts adults use. Allowing children under 57 inches to sit in the same seat as an adult usually forces the seat belt across their necks and abdomens, rather than their shoulders and hips. This can be a dangerous and life-threatening situation if you are ever in a crash with a small child. There are also car seats that are designed specifically for children with special needs to ensure they are as safe as possible when riding in a vehicle. 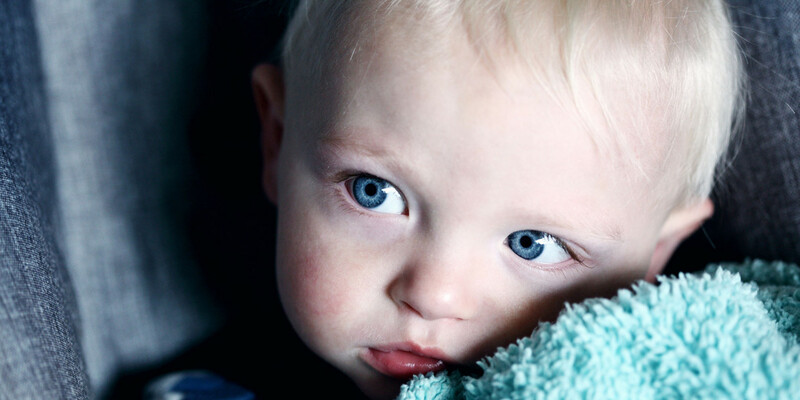 There are bed style seats for babies weighing under five pounds, as well as other, larger options for children who have neurological or breathing disorders – your doctor will help you choose the right option for your child’s needs. No matter whether you are buying a front facing or rear facing car seat, there are a few features that you should look for to make sure you are getting the best choice for you and your child. Harness System – A five-point harness features straps over both shoulders and thighs, and has an additional one that that goes between your child’s legs. These are the safest belting options for children up to 100 pounds. Ease of Use – Look for a seat that allows for easy adjustments of the harness. You will want one that does not require you to rethread the harness to adjust the size for your growing baby, as this process can be quite difficult. LATCH System – All car seats are equipped with the LATCH system, which allows you to secure the seat to specially mounted anchors in your vehicle. This drastically reduces the amount your car seat can move in an accident, and makes sure it doesn’t become a projectile in severe crashes. Washable – Babies will make messes in the car seat, so make sure you choose one that has a cover that is both easy to remove, and machine washable to make your life easier. Safety Features – Look for seats that provide energy absorbing padding and side impact protection. These will provide additional protection to keep baby safe if there is an accident. Once you find a seat that has the features and design that you want, you will want to make sure that it will fit in your vehicle before you buy. Some are quite bulky and won’t work well in smaller vehicles. Once you find one that fits and has the features and design that you want, you will have a safe seat for your baby to ensure he or she is protected as much as possible when you are out driving. As your child progresses from babyhood to toddler age, you will need to consider a booster seat to make sure that he or she is safe until they are big enough to safely wear an adult seat belt. The Graco Affix Youth Booster Seat is a popular choice, which is why we’ve chosen to review it to see if it is a good option. Whether you are using a baby car seat, a high back booster, or a backless booster, safety is always the first concern. The Graco Affix Youth Booster Seat ensures that your child is protected in any vehicle by positioning the seatbelt so that it fits him or her properly. This booster seat connects to your vehicle with the LATCH system, which ensures that it does not move or become a projectile if you are in an accident. When used in high back mode, it will provide protection for children weighing 30 to 100 pounds, and who are 38 to 57 inches tall. For bigger kids, the backless mode positions the seatbelt from 40 to 100 pounds, and 40 to 57 inches tall. The booster has been rigorously tested to ensure that it meets or exceeds the recommended US safety standards. It also features energy absorbing foam that absorbs the shock of any impact to the vehicle. The Graco Affix has also undergone side impact safety testing for added peace of mind. There are two other important safety considerations with this booster. When in high back mode, it provides padded sides at head level, which will provide added shock absorbency in the event of an accident. There is also a shoulder belt guide in high back mode, which ensures that the adult size seatbelts cross across the child’s shoulder, rather than the neck, which often occurs with boosters without seatbelt guides. The Graco Affix Youth Booster Seat provides plenty of padding in both high back and backless mode, helping to keep your older child more comfortable during long car rides. The seatbelt positioning on the high back mode ensures there is no discomfort from the belt cutting into the neck as well. The high back mode also features a recline adjustment, which allows children to sleep, without their heads slumping forward in an uncomfortable and potentially dangerous way. This booster seat also comes with a cup holder and storage compartment that folds away. While it appears that there is a hard plastic cup holder, it is actually an elastic holder. This provides two different benefits – it accommodates a range of cup and bottle sizes, and it doesn’t add additional bulk or width to the seat since it is not rigid plastic. The compartment and cup holder are both within easy reach of any child sitting in the booster, helping to ensure that he or she does not unbuckle to reach objects that are too far away. The Graco Affix Youth Booster Seat is surprisingly easy to install with the LATCH system. However, the setup for the LATCH buckles in so that they are both integrated into the same buckle. This does result in the booster appearing a bit looser on one side than the other. The looseness allows for around five inches of movement with the booster. While some may find this disconcerting, it is important to remember that the majority of the protection is provided by the vehicle’s seatbelt. The LATCH simply holds it in place so that it doesn’t move over, or become a projectile in the event of an accident. This booster has a removable cover that is machine washable. It is fairly easy to remove and reattach, making it easier than ever to clean up any messes or spills. The seat also includes armrests that are a bit longer than what are available on most booster seats. Unfortunately, they are not moveable or adjustable. As they are in a fixed position, it does make it difficult for some children to be a “big” kid and buckle themselves in on their own. This booster seat is a bit heavier than other options available, but not so heavy that it makes moving it from one vehicle to another very difficult. In many cases, children that love to “help” will usually be able to transport it short distances on their own, which is always important when children reach the age when they want to start being just a bit more independent. The Graco Affix Youth Booster Seat has both pros and cons that should be considered prior to purchasing to ensure it will work best for you and your child. When your child outgrows a car seat, you will need both a high back and a backless booster to use before he or she reaches the recommended height to be safe using an adult seat belt. The Graco Affix Youth Booster Seat provides a high back mode that can be converted to backless, allowing it to last for the rest of the time your child needs a booster. While there are a few negatives, overall, this is a great booster seat option. With plenty of features, ease of use, and a great price, many parents will appreciate the safety of this convertible booster seat. When it comes to car seats, there are two things that most parents realize – safety is a no brainer, and you already know you will be buying another within a year or less. However, the different lines of convertible car seats have changed the latter, and the Evenflo Symphony LX changes it completely. This car seat is designed to be the only car seat you will ever need, from birth all the way up to 110 lbs. If you’re wondering whether a car seat can really pull that off and still be worth the cost, this review will answer all of your questions, and help you decide whether this car seat is right for you and your baby. This car seat is an extended use model that starts out as rear facing, then changes to front facing, and ends up as a booster that your child can use until he or she weighs more than 110 pounds. On top of the versatility, Evenflo made sure that this seat was as safe as possible, even meeting or exceeding some of the federal safety standards. The seat also provides plenty of ease of use features as well, which makes a huge difference on both long and short trips. Meets or exceeds both their own and all applicable safety standards for side impact testing. Maintains structural integrity at levels of energy that are twice the federal crash test standard. Meets Flammability of Interior Materials standards for Federal Motor Vehicle Safety. Aircraft certified for FAA Inversion when five point harness is used. Exceeds Evenflo standards for integrity in high and low temperature settings. Car seats are notoriously somewhat difficult to install and use at times, making ease of use an important factor. 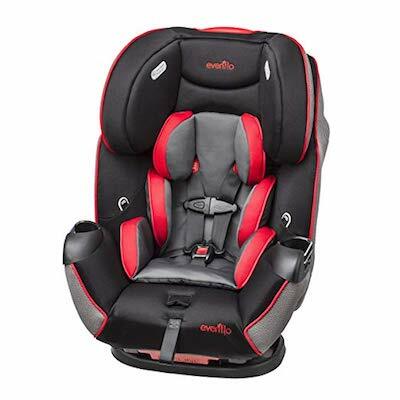 This Evenflo seat includes the Infinite Slide Harness, which allows for easy adjusting as your child grows, without requiring rethreading of the harness. Installation is quick and easy with the Quick Connector LATCH, which most users are able to attach and remove with one hand. The headrest is also easily adjusted with one hand, making growth adjustments simple. The machine washable cover is also easy to remove and replace, and does not require harness rethreading. Every parent knows that a comfortable child means a happier trip, and Evenflo includes a few different design options to help. The seat comes with both a head and body pillow to ensure infants are comfortable and safe during a ride. Older children appreciate the built in, adjustable cup holder, that also ensures there is no unbuckling when they can’t reach a drink. The easily adjustable harness also ensures that there is no pinching or squeezing when mom or dad has to adjust the size. There is also an easy recline feature located on the front of the car seat for easy adjusting when your child is tired and wakes up. The Evenflo Symphony LX All in One car seat provides both enhanced safety and easy installation, both of which are vitally important when buying a seat for your little one. 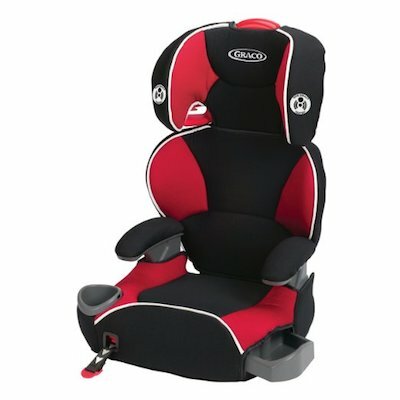 The broad weight and height range makes this a true all in one unit that will last from infancy all the way until they no longer need a booster seat, which is generally around nine or ten years old. With proper care, this car seat can easily last that long, so you will never need to buy a second or third seat as your child grows. Many parents who have struggles with the LATCH systems in the past will appreciate the easy to use Quick Connector, while also knowing they have the added protection. No review is complete without the negative points as well, and there are a couple. There is very little padding in the actual seat where your child sits, which can get uncomfortable with long trips – especially as he or she gets bigger. Another issue is that some smaller children end up with their heads leaning forward when sleeping, even when the seat is reclined all the way. The final issue with this car seat is that it is not a great fit in very small or compact cars. In some cases, the LATCH connectors will not work properly due to the size of the car seat versus the amount of space available to run the straps to the connectors. If you are looking for an all in one car seat that is safety tested, and proven easy to use and install in most situations, the Evenflo Symphony LX All in One convertible car seat may be a great option – as long as your vehicle is large enough to accommodate it properly. Britax has been a big name in car seats for several years due to their attention to safety and ease of use. Our reviewers put this car seat to the test to determine if it lived up to the hype. Keep reading to find out if the Britax Marathon G4.1 is the best option for your child. The Marathon G4.1 is a convertible car seat designed for children between 5 and 65 pounds, and up to 49 inches. The seat can be used rear facing for children up to 40 pounds, which minimizes the need for buying multiple car seats to adjust for size. Britax includes a range of features on this model, with a clear focus on safety and ease of use. Versa Tether – This is a tethering system designed to absorb energy, resulting in little to no movement when the vehicle is involved in a crash. HUGS – Chest pad that is available only from Britax that reduces the child’s forward momentum in the event of an accident. Integrated Steel Bars – Advanced safety system that provides a stronger connection to the vehicle, and minimizes the chances of the seat flexing forward. SafeCells – Special cells that are located in the base of the car seat. These Cells compress during an accident to drop the child’s center of gravity to absorb and prevent forward motion of the seat. Side Impact Protection – Uses a combination of a deep, rigid shell on the sides of the seat that are filled with energy-absorbing foam to provide better protection against head and chest injuries during side impacts. Built In Lock Offs – Locking mechanisms that are built into the seat belt paths to provide a snug, secure fit when using the car safety belts to secure the car seat. Quick Adjust Harness. This Britax features a harness that allows for quick and easy adjustment with ten different positions to allow for the best fit for each child. The five-point harness system is designed to be tangle free, and does not require rethreading for adjustments or cleaning. The buckle system also has two adjustment options to allow for optimal fit, while the EZ-Buckle prevents it from slipping under the child when putting him or her in the vehicle. This car seat includes both the anti-slip base and lower LATCH connectors that make a clicking sound when installed properly, and includes a pull strap to ensure the tightest fit. Once the base is installed using LATCH, parents can simply push a button to release the car seat from the base. The base features IsoFit, which provides a protective and non-slip grip on the seat of the car to prevent the seat from slipping or sliding when putting your child in, and during an accident. The Marathon G4.1 has high-density soft foam padding covering the seat to provide a softer riding surface. The seat can also be reclined in both forward facing and rear facing installations to provide better positioning for naps during long car rides. The seat also comes with an infant pillow to help improve the fit for infants, as the seat is designed for children who have a sitting height of nine inches at the shoulder. This pillow also provides additional support around the head and neck. There are several features that increase the overall ease of use of the Britax Marathon G4. The ability to use the seat for both rear and front facing makes it a convenient option for those who want to avoid having to buy another car seat when the baby reaches about one year of age. The five-point harness can be adjusted with one hand, and the buckle system eliminates the potential for your child to be scratched or pinched when trying to buckle the harness. Finally, the fact that the harness does not have to be rethreaded after cleaning or adjusting makes this a convertible seat that is easier to use than many other options. As you can see, the Britax Marathon G4.1 provides a wide range of safety, comfort, and ease of use features. 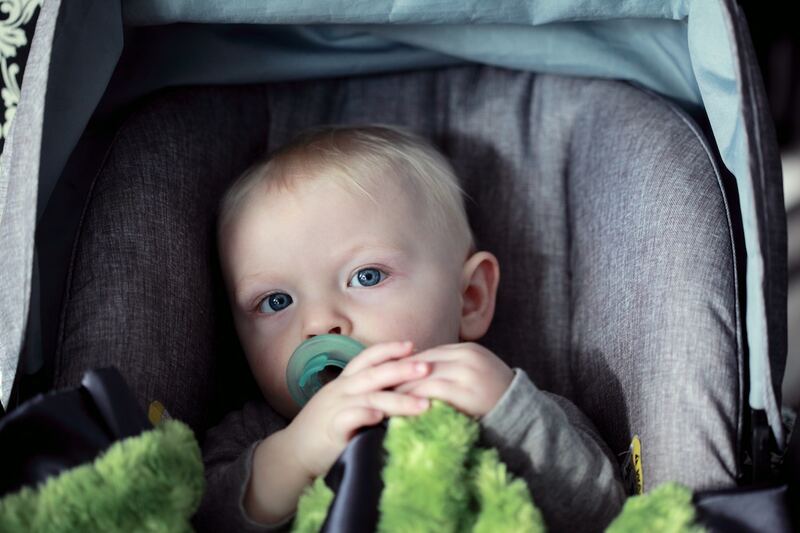 The extreme focus on safety ensures the safest ride for your infant or toddler, and provides the added protection that provides peace of mind for any parent. Add in the comfort features, and you have a car seat that is well rounded, and provides nearly everything you and your baby need. While this car seat does provide many positive points, there are also a couple of bad ones of which you need to be aware. While the cover does remove easily for cleaning and does not require rethreading, it may be best to hand wash it. Our reviewers discovered that the padding does not handle machine washing or drying well, and replacement covers are rather expensive. Price is another important consideration for this car seat, as it can run at around the $200 or higher mark. However, when you consider the safety of the unit, many may find this price perfectly acceptable. Some users also had some difficulty getting the release button pushed down to unbuckle their child. While this is a great thing as far as comfort is concerned, it could be an issue if you need to remove the child quickly. 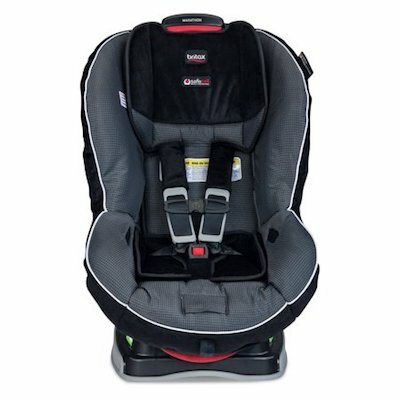 All in all, the Britax Marathon G4.1 is a safe, comfortable, easy to use car convertible car seat. While there are a few negatives with this unit, the benefits in safety alone far outweigh these issues.